It's Hall of Fame voting season, so I thought I'd contribute my thoughts to the conversation. 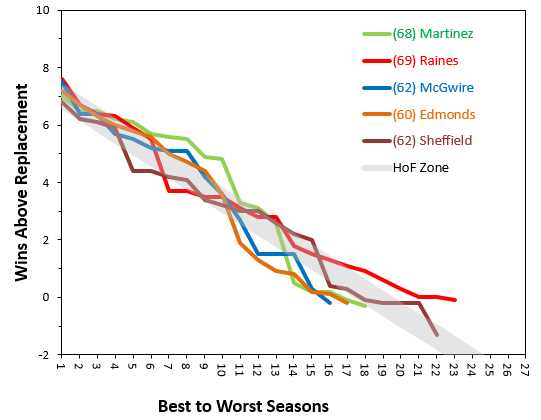 "Best to Worst season WAR" graphs, innovated by Sky Kalkman back when he was providing the sabersphere a "hint of lime," have long been my favorite tool for an initial screen of Hall of Fame candidates, and I used to do an annual post at Beyond the Boxscore looking at each year's ballot. Let's do it again! 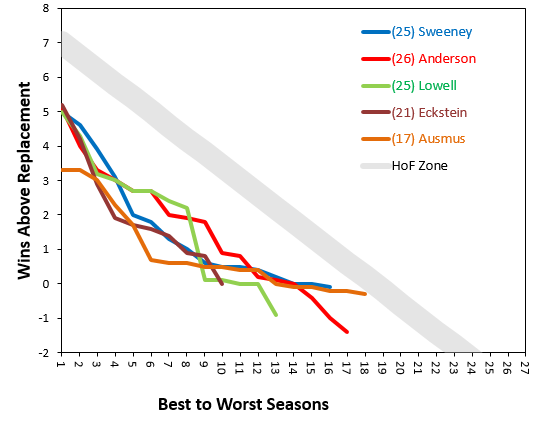 Some quick methods notes: the gray line in the graphs is the "Hall of Fame Zone," which is based on a (now old) study by Jeff Zimmerman, and spans from the 20th percentile Hall of Famer to the 50th percentile Hall of Famer. There are Hall of Fame players below that line (20% of Hall of Famer seasons, in fact!). Nevertheless, given the occasional questionable decision by the BBWAA, it seems a good benchmark that players should be within or above that zone for at least a good chunk of their careers. This is not the only thing that matters, and other metrics (like Hall of Stats' Hall Score) are also useful, as are more nuanced investigations of player careers. But this is still my favorite approach. There are four starting pitchers on the Hall of Fame ballot this year. The benchmark for pitchers in the Hall of Fame, based on other pitchers already in the Hall, is a tad lower than it is for position players (~.5 WAR per season of their career). Nevertheless, it's hard for pitchers to get into the Hall because injuries tend to shorten careers so quickly. Of the candidates, based strictly on the numbers, three are clearly deserving and, should be shoo-ins: Roger Clemens, Curt Schilling, and Mike Mussina. Mussina maybe didn't have the fame of the others, but I'm frankly baffled at the pushback that Schilling gets. As Tom Tango and others have argued, Schilling is the pitcher that voters seemed to think Jack Morris was: he was dominant in the regular season, and just unbelievable in the postseason. The numbers above don't include his postseason, but between his ridiculous performance for the '01 Diamondbacks (including the World Series MVP) and the whole bloody sock thing for the '04 Red Sox, he really is the consummate postseason ace. His career line in postseason action? 133 1/3 innings, 2.23 ERA, 8.1:1.7 k/9:bb/9. Pure dominance. Voting shall be based upon the player's record, playing ability, integrity, sportsmanship, character, and contributions to the team(s) on which the player played. Does a player's use of performance enhancing drugs disqualify them based on "integrity, sportsmanship, and character"? I definitely see a strong case for this. At the same time, there are some really despicable characters already in the Hall of Fame (Ty Cobb is the standard example). And there was rampant drug use throughout the '70's and 80's before steroids started to appear in the game (especially amphetamines), so it's hardly the case that the "steroid" era players were the first to use performance-enhancing substances. Finally, while we do know that some Hall of Fame-caliber players definitely used (Clemens, Bonds, McGwire), there are a lot of guys who probably also used in that era who we don't know about. And we can't guess, either: I'm really disturbed by the "witch hunt" that seemingly has been going on, with guys like Jeff Bagwell accused and therefore passed over for the Hall without a shred of evidence. What I've arrived at is the notion that the Hall of Fame is a museum, and "Hall of Famer" players are those who made the largest impact on the game via their play on the field. Those impacts don't have to be universally positive. If that's my definition, then there's no question, in my mind, that Clemens should be inducted. I'd put him on my ballot. There are three relievers on the ballot: Lee Smith (who is returning), Billy Wagner, and Trevor Hoffman. For comparison, I've also plotted Hall of Famers Bruce Sutter and Rollie Fingers. I really don't know what to do with relievers. As the graph indicates they really just don't pitch enough innings to get anywhere close to the Hall of Fame zone. Furthermore, in almost all cases, we have a set of players self-selected to be relievers because they weren't good enough to be starting pitchers. That makes it pretty hard to give them serious consideration. That said, if you believe that Rollie Fingers deserves to be in the Hall of Fame, then you would be hard-pressed to deny Lee Smith, Trevor Hoffman, or Billy Wagner those same honors. They were basically all just as successful as the other. 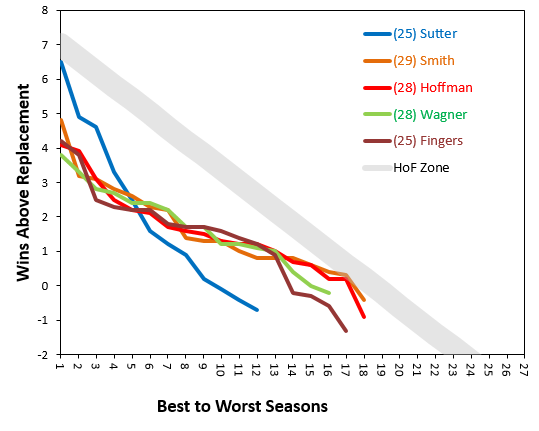 They didn't have Sutter's peak (or, of course, Sutter's inning totals), but they all had greater longevity and were the best at their "position" during much of their careers. I don't think any of them are shoe-ins, but I can see an argument. There are a lot of hitters on the ballot, as there are every year. I'm going to work through them in order of decreasing career WAR, five at a time. Bonds: See comments above about Clemens. Except that Bonds is probably the best hitter ever. I was kind of relieved to see how well Griffey rates out here. His tenure with the Reds (which is largely at the right tail of his line) was sad and depressing. But he was so darn good while with the Mariners that he was already pretty much a lock of the Hall before he arrived in Cincinnati. 10 seasons well above the Hall of Fame average makes him an easy pick. The other slam dunk here is Jeff Bagwell. Bagwell might not have had the longevity of some players on this list, but he was brilliant throughout his career. I always remember him as having such an aggressive swing. He leaned in so much that I always thought he was off-balance. And yet, he walked a ton, and struck out at a pretty low rate for a player with so much power. Alan Trammell's is almost a carbon-copy of Barry Larkin's career. He was on the ballot before Larkin arrived, and they both deserve to be in the Hall. Barry got in. But this is Trammell's last chance (to be voted in, at least). The only player on this list who is a little bit questionable, maybe, is Larry Walker. Walker had those two brilliant years, and was usually near the performance of the other guys. But his #3 through #7 seasons were just very good, not great. 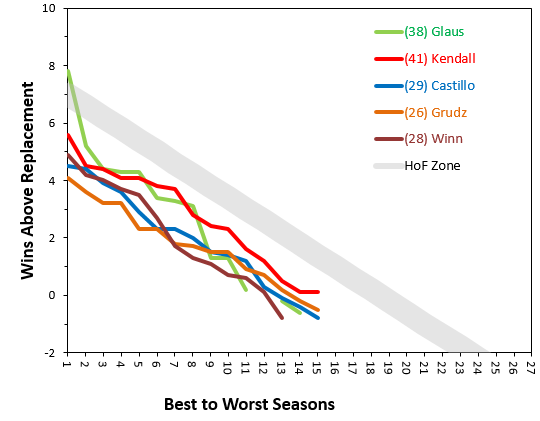 But despite his reputation for being fragile, he had longevity: his 8th-best season, which was still pushing 5 WAR, was right-on Hall of Fame average, and he stuck there the rest of his career. If you push some of those peak year WAR into the #3-#7 seasons, his line might look a bit more compelling. I just don't think there's much of a counter-argument here. Mark McGwire has the controversy due to his PED use, but at least he's admitted it and tried to move on. His career is a lot like Edmonds', and his home run chase in '98, even despite the subsequent steroid scandal, still did more good for baseball than anything else I've personally ever seen. Tim Raines is a sabermetric darling, mostly because he made such an impact on several important Expos fans and superb sabermetricians, most notably including Tom Tango. His peak was very good, and he had the longevity. The middle-tier of his career wasn't quite there, though. He reminds me a lot of Larry Walker, at least in terms of overall numbers and shape of his curve. It's a solid case, but not a slam dunk. That leaves Gary Sheffield, and he's the first who is probably best labeled "debatable." He had tremendous longevity, but his peak years rate out as being around the 25th to 30th percentile Hall of Famer. So, maybe? Mike Piazza was a very near miss last year, and seems to be getting a lot of support this voting season. But by these numbers, at least, he is not overly compelling. The Hall of Stats gives catchers a substantial boost by default, because otherwise the demands of the position prevent them from posting totals that keep up with other positions. They don't play as many games per season, and they don't play as many years...or if they do, they age faster. 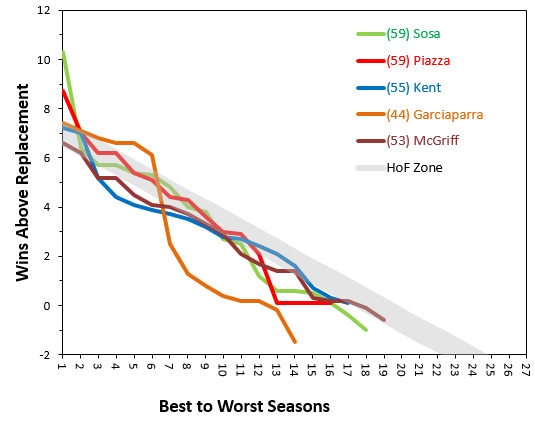 Plus, we don't have data on some of the things that Piazza might have done well (e.g. was he a good framer? Was he, as I've heard argued more recently, a great game-caller? ), so this might be underrating him. Still, I don't think I'd rate him better than "solid." Similar to Piazza's curve is Slammin' Sammy Sosa's. Sosa had the better peak season, but otherwise Piazza's line matches Sammy's very well. I'm not willing to give Sosa quite as much benefit of doubt, however, because I feel like we probably had a better read on his fielding. Garciaparra is such an interesting case. He's a little bit like Ernie Banks in that he had a wonderful part to his career that lasted about 6 seasons (Banks lasted about 7, and peaked better), but then a huge drop-off in his production afterward. If you're someone who puts almost all the emphasis on the peak 5 seasons, I can see an argument for Nomar. But I think he's probably falling a tad short for me, given how bad he was outside of his peak. Jeff Kent and Fred McGriff are also, I think, falling just a tad short. Both were very, very good players for a long time. But I think they don't quite make my Hall of Fame. I'm surprised every time I see Troy Glaus's almost-8 win season. But while he was a very good third baseman, he didn't quite reach Hall of Fame standing, much like the other players on these two graphs. McGwire gets squeezed...and I won't lie that part of the reason for that is the steroid thing. Push comes to shove, I guess PED's do matter to me, at least as a tiebreaker. Given how many are on this ballot already, I'm inclined to leave off those I flagged as "debatable," which includes all of the relievers. Great players, all, but I can't vote for everybody. Of those on this list, six were on my ballot when I last did this for the 2011 ballot: Bagwell, Trammell, Martinez, McGwire, Raines, and Walker. Time to get your act together, BBWAA!